"For many years, we've made a serious mistake. We believed we were living in a civilized world. Today, we find that, for years, we've been living in a jungle. Regulations were put into effect and we attempted to live up to them. Now we discover there's only one regulation. Kill or be killed. I'm ready to observe that regulation. I've come to ask you how we can change over in this jungle from the murdered Norwegian people to the murdering Norwegian people." As the rousing score rolls over the main titles, there's no mistaking Commandos Strike at Dawn for anything but a flag-waving wartime propaganda flick. Even the DVD artwork makes the film look like a typical, undistinguished World War II battle epic. But once the movie begins, it's clear Commandos leans more toward inspirational human drama, saving its military confrontations for its climax. The often intimate, sensitive storyline is a welcome surprise, and lifts this largely unknown and under-appreciated film above others in its genre. Produced with customary frugality by Columbia, Commandos Strike at Dawn may lack glossy production values, but nonetheless features powerhouse talent on both sides of the camera. Leading the charge is actor Paul Muni, so respected in his day that in earlier films he often was billed as Mr. Paul Muni. An unabashed chameleon who felt more comfortable with his face obscured by heavy make-up, Muni wowed audiences in pompous biographies of Louis Pasteur, Emile Zola and Mexican president Benito Juarez, but appears here unmasked as a gentle widower with a young daughter who realizes he must shuck his pacifist upbringing to halt the Nazi threat. The time is 1939 and the place is idyllic Norway, a land unaccustomed to strife and blissfully isolated from the storm clouds swirling around Europe. When the Nazis invade, they warn against resistance and promise to respect Norway's neutrality. The Norwegians foolishly believe them, but soon become suspicious when Nazi soldiers burn books, confiscate radios and brainwash students in local schools. Mild-mannered fisherman Erik Toresen (Muni) sees the handwriting on the wall and mobilizes his community, believing an escape to Britain would alert the Allies to Norway's plight and help them beat back the Nazis. Commandos Strike at Dawn quietly yet powerfully conveys the effects of occupation and the mounting infringements that force a peaceful nation to abandon its values and take up arms. The Norwegians' slow realization of the Nazis' treacherous nature is realistically presented; ditto their evolution from passive bystanders to passionate freedom fighters. Sadly, the climactic commando raid looks pretty chintzy�thanks to Columbia's rigid low-budget standards�but still packs a punch. It's just a shame the studio didn't lavish more attention on such a strong property. Irwin Shaw (The Young Lions, Rich Man Poor Man) adapted the screenplay from a story by C.S. Forester (Captain Horatio Hornblower) and wisely focuses on interpersonal relationships and moral dilemmas�elements that would later become his trademark. John Farrow (Mia's dad) directs with a firm hand, marching the story along but unafraid to linger on tender scenes to develop characters and heighten mood. The supporting cast, a veritable who's-who of recognizable faces, includes Anna Lee (as Muni's British love interest), Lillian Gish, Cedric Hardwicke, Ray Collins and Rosemary DeCamp. But Commandos is Muni's picture all the way, and he files an understated yet forceful portrayal despite an often suspect Norwegian accent. While Commandos Strike at Dawn is dated in many respects, it remains both effective and affecting. Its battle sequences pale when compared to other, better known war movies, but its story of faith and resilience ranks with some of the period's best. Image Transfer Review: Considering the film's age and obscure nature, Columbia has done an admirable job bringing it to DVD. The biggest obstacle for the technical team must have been to locate a decent master print, and while what was used is far from pristine, exhibiting heavy and almost constant specks, blotches and scratches, it's probably the best they could find. No gripes there. Even the dense grain doesn't bother me, as it lends the film a cozy warmth that augments the personal story. However, it irks me to see "remastered in high definition" plastered across the packaging�definitely a misnomer in this case. Consumers will expect a spotless picture and most won't take into account (or be aware of) the film's heritage. Sure, close-ups are clear and bright daylight scenes possess nice contrast, but much of Commandos transpires at night, and the transfer can't handle the low light levels. At such points, video is muddy and vague, as blacks bleed across the screen and wash out detail. Coupled with the surface defects, the end result doesn't jive with what's advertised on the sleeve, and will certainly disappoint those who purchase it. The Columbia team should be commended for greatly improving the image, but they can't overcome the ravages of time. Somehow, this should be stated on the box. Audio Transfer Review: The original mono track has been noticeably cleaned up and possesses surprising depth, with lots of detail and subtleties coming through. While some audio hiss occasionally intrudes, the bulk of the soundtrack remains distortion-free, with dialogue always vibrant and understandable. As the score swells and bombs fall, the track often reaches impressive heights, making one forget the film is 60 years old. Extras Review: Three trailers for other, more famous Columbia war films are the only extras offered. 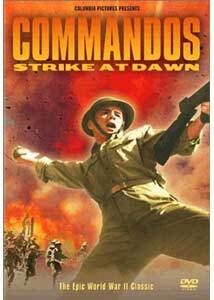 Commandos Strike at Dawn is a welcome DVD release, as it chronicles events that received little attention from Hollywood during the war years and resurrects a worthwhile film from oblivion. Diehard WWII enthusiasts will surely want to add it to their collection, but all fans of classic cinema should give it a try.